This custom guard featured double sliding doors on both sides of the enclosure to allow access along a conveyor process. Each end has double hinged doors to insert and remove parts at each end of the process. In January 2015, we worked with our client to design custom guarding for a grinding and planing machine. 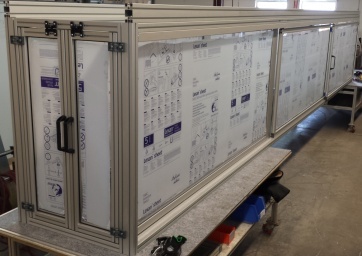 The guard consisted of MiniTec double sliding doors on both sides of a 24 ft long enclosure. The ends each had double hinged doors. All panels were clear Lexan polycarbonate.